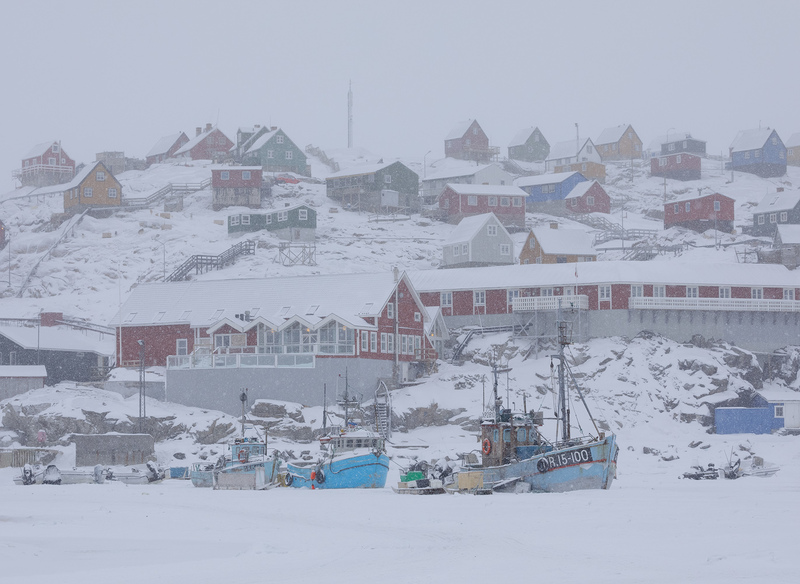 Earlier this year, I was sent on assignment to shoot Greenland in winter. This was a trip I had been wanting to do for years, but it always fell through due to scheduling conflicts and the fact that visiting Greenland would be quite expensive to do on my own. 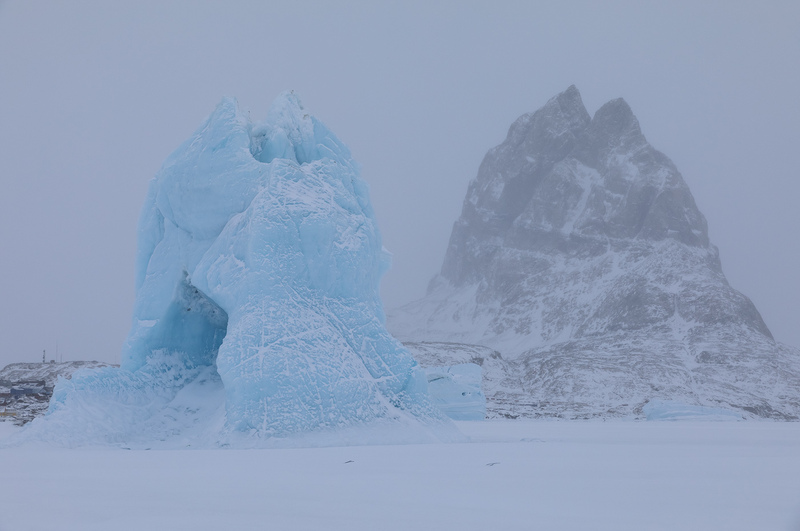 Luckily, I was approached by Air Greenland and Visit Greenland, in collaboration with my long-time friends and partners at Square Rock, and given the necessary financial support to finally realize this dream. Being sent on an assignment and given a green light to shoot whatever I wished and realize my passion was incredible. Indeed, on the one hand, I was a bit stressed by the need to justify the costs and produce good results for my sponsors. But on the other hand, I was completely free to go and do as I pleased, all taken care of. I was determined to take full advantage of the opportunity, and I'd like to tell you the story of my trip in this series of articles. When Air Greenland is one of your sponsors, imagination flies. At the beginning, I naturally leaned toward destinations which I would never conceivably visit on my own. 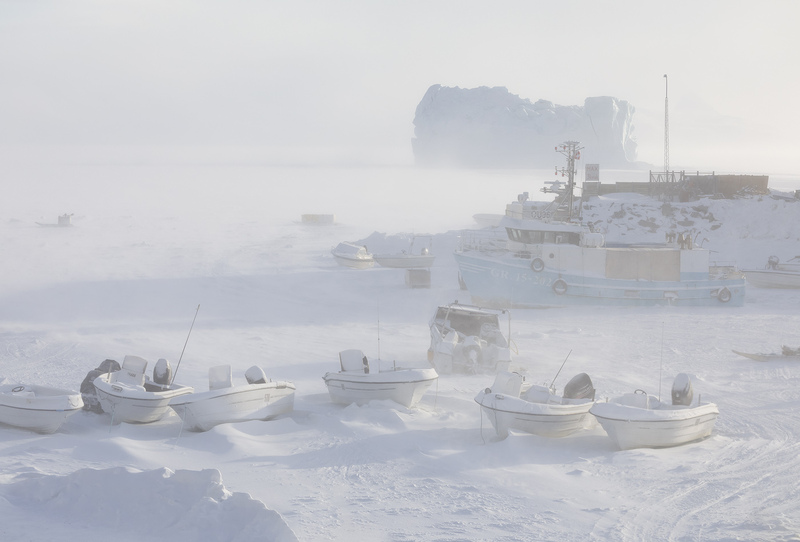 Qaanaaq, in the far Arctic north of Greenland, was a candidate. But I was very quickly made to understand that since I was to produce images that would promote tourism in Greenland, I would need to go somewhere where tourists might actually go! Domestic flights to Qaanaaq cost upward of $2,000, and that's not including the flight to Greenland in the first place… not exactly tourist friendly. Alright, now what? A few options came to mind. The first was the southern tip of Greenland, which boasts fantastic fjords and mountains, and a good latitude for Northern Lights. It was a good option but the problem was that there is no stable sea ice to go on. I really wanted to drive or walk close to icebergs embedded in sea ice. Another option was Scoresby Sound, an excellent location to which I also hadn't visited. 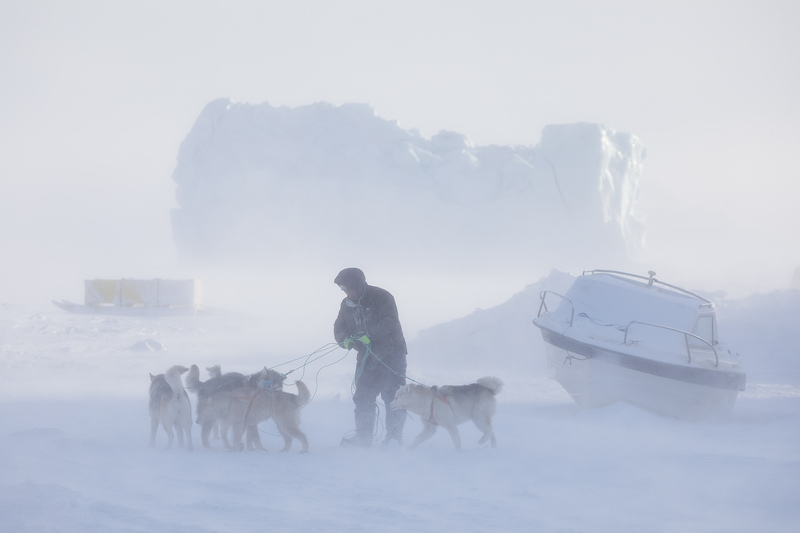 There is plenty of stable sea ice there and an option to dogsled all around and get close to embedded icebergs. The problem with this one is that there wasn't quite enough material there to fill my two-week time frame. 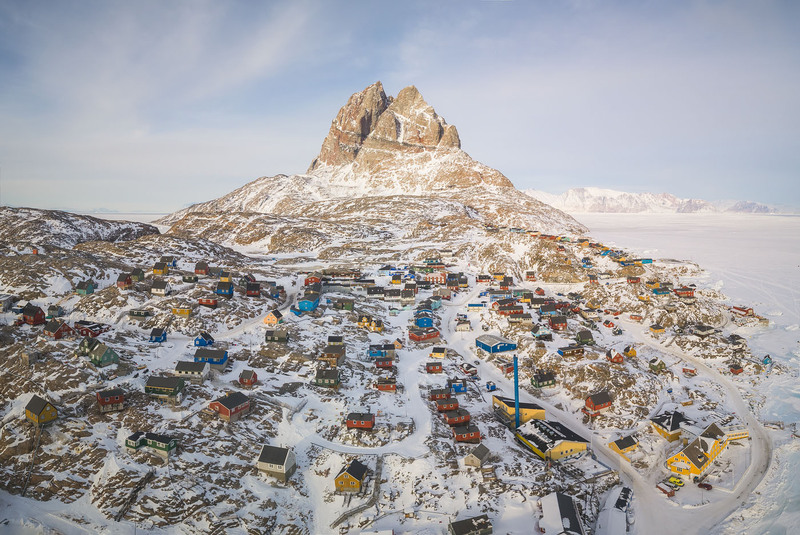 Uummannaq Island lies in the middle of Uummannaq Fjord, which was perfect in what it offered: solid, far-reaching sea ice and several glaciers which produce beautiful icebergs. The icebergs travel into the fjord and, in winter, they get stuck in the sea ice—some of them very close to town. 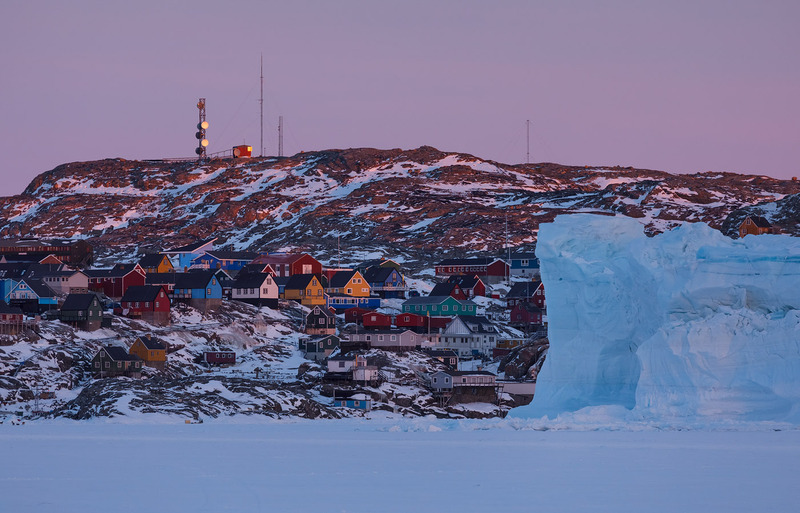 Uummannaq is a small town but not too small—the infrastructure was more than enough for my needs. I was housed in a very comfortable little guest house right next to the harbor, and there was a restaurant downstairs and a supermarket nearby. I was assigned a local guide who took very good care of me throughout my stay, accommodated my photographic needs and schedule, made sure I was safe and warm at all times and was fun to be around. 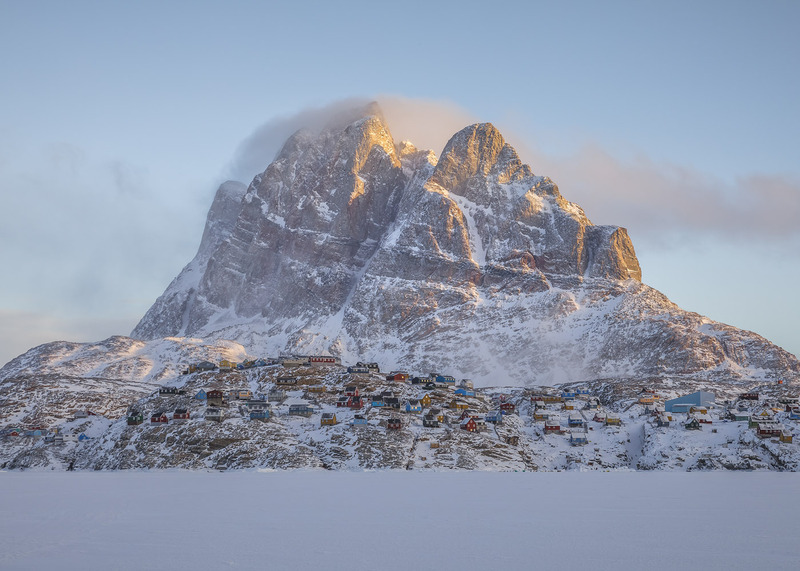 Uummannaq is at about 70 degrees north, in the far west of Greenland. Getting there from Leknes, Norway, where I had been guiding beforehand, involved no less than eight flights, the last of them by helicopter. The views from the air were admittedly spectacular, but I would have appreciated a shorter route. Upon arriving at the heliport I was greeted by very cold weather. Even though I had already been in the Arctic for 1.5 months right before arrival, it had been in places with milder weather. 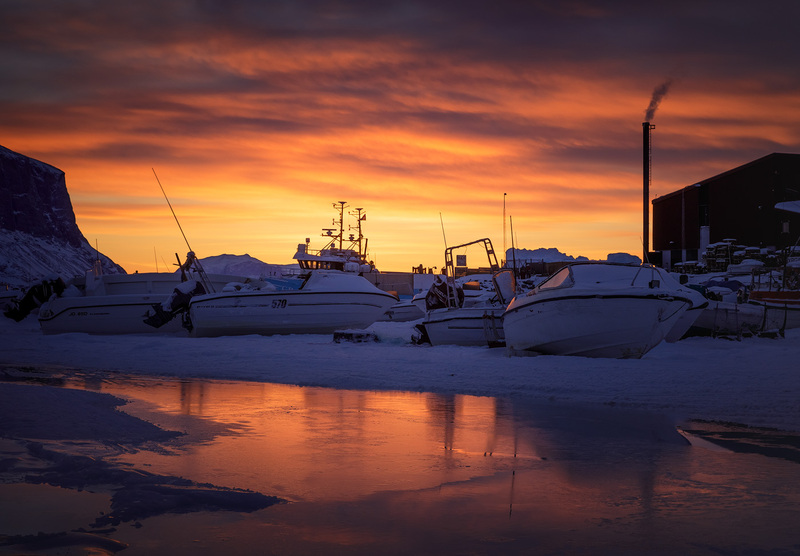 For example, temperatures in the Lofoten Islands rarely go lower than -10 Centigrade. 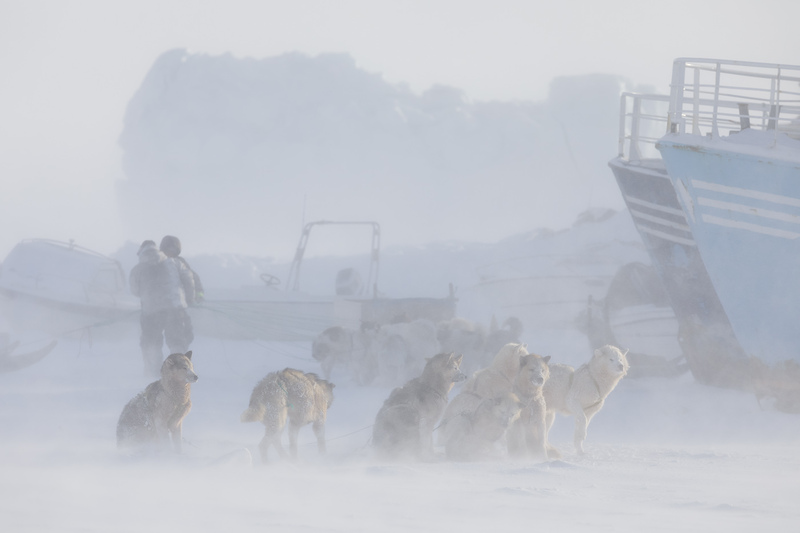 Greenland is a different story altogether, and your first breaths at -25 degrees are hard. I had never had to experience this type of temperatures for an extended period of time before—my lungs rejected the cold air and I started coughing until my body got used to the new situation. After meeting my guide Paaluk and settling into the guest house, I started exploring. That is, if you call being bombarded by snow and gale-force winds exploring. The first day was quite miserable. With temperatures down to -28 and strong winds, it was very hard to move around, much less shoot. My hands and feet went numb several times, I suffered frostbite on my nose, and was generally frustrated with the lack of light and the harshness of the situation. 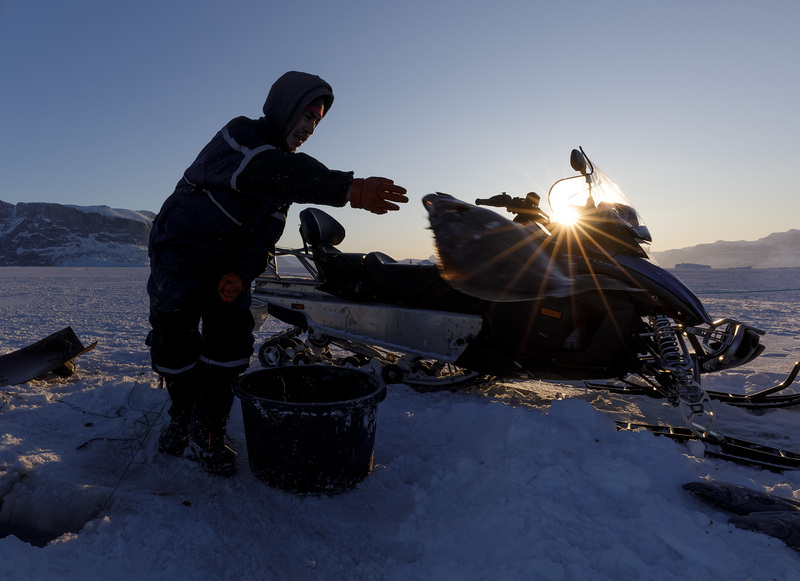 The upside was that the weather conditions supplied very interesting photographic material, and even though I sometimes had to go back to the guesthouse to get warm, I did get interesting shots of the locals working and handling their sled dogs. 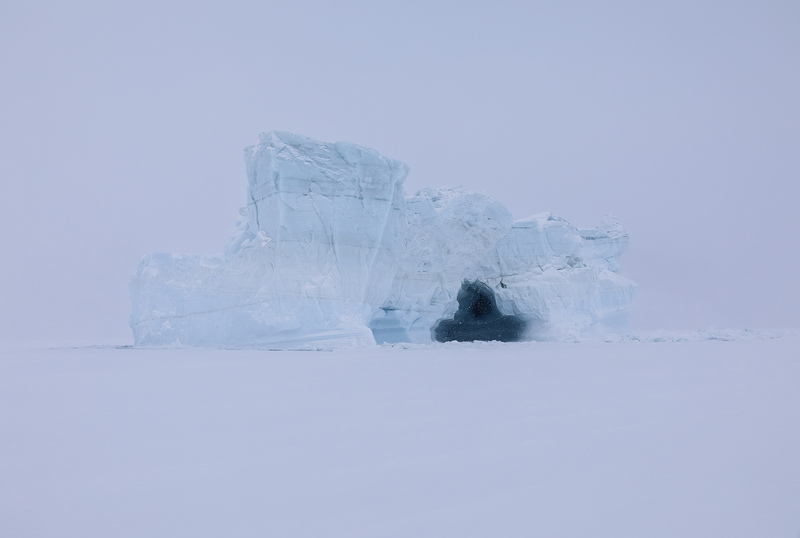 I also hiked to the icebergs embedded in the sea ice to shoot them during the whiteout. There were several beautiful icebergs right outside town, and all I had to do to get to them was go down to the harbor and walk for 20 minutes, which also warmed me up a bit. There were also several additional icebergs a bit further away, and I sometimes hiked there or took a ride on Paaluk's snowmobile. 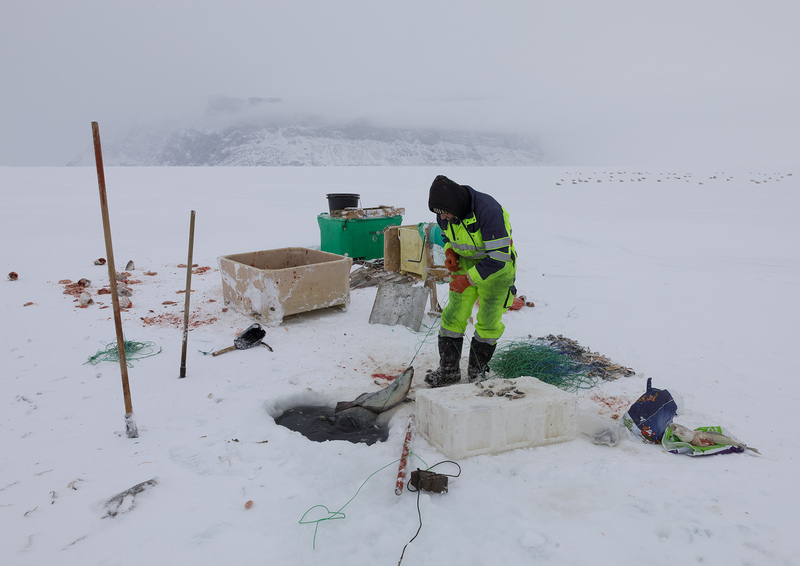 Finally, I also took some images of the ice fishermen at work. It astounded me how these men were working throughout the day, no matter the weather. These guys are tough! Shooting in the snow and gale was very interesting but a bit hard. Luckily, the upcoming days were much nicer and offered other kinds of photography like the shot you see below. But more on that in Part 2.